You’re moving out. The new place is ready. Time’s up and you’ve got to go. And then, right when you were feeling like you’d make it to the finish line without going completely nuts, the weatherman lets you know a storm might be headed your way on moving day. Super! Before you chuck your moving day plans or start working on your anti-rain dance, know this: Unless it's really bad, you’ll probably still be able to move. You just need to do some extra prep. Still, we'll admit that moving in bad weather—whether it's a drizzle or a downpour—can be a total PITA. But you can make things easier on yourself. Just follow these tips to keep you and your belongings safe. If you’ve hired the right movers, they can help protect your goods from the elements on moving day. But if you want to get a jump on things and safeguard your most treasured furniture and fragile items, the pros recommend one simple trick: shrink-wrap. Sure, you can buy specialized accessories such as plastic tarps to cover your furniture, but in lousy weather they might not work well. “In windy conditions you’ll spend an appreciable amount of time just trying to keep that tarp from blowing off whatever it is supposed to be protecting,” Glanz says. Instead, cover anything you’re worried about in a few layers of shrink-wrap. You can buy the heavy-duty rolls from moving and packing companies and at many hardware stores. Cardboard will soak up water fast, so slip big plastic bags over your moving boxes. Wrap artwork in plastic wrap to prevent rain or snow from getting into gaps in the frame. Put a large trash bag around groups of clothes to keep them dry. Use heavy blankets and sheets to protect wood furniture. And don’t forget to set aside a towel you can grab quickly to wipe off any wet spots before water damage occurs. 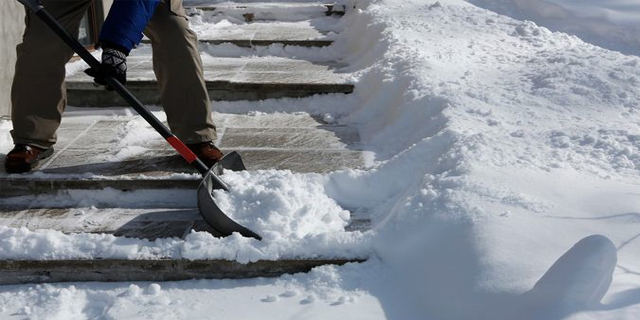 “In snowy weather, in particular, plan ahead to clear any passageways that might be filled with snow or ice with sand and/or salt,” says TJ Peterson, a representative with Oz Moving and Storage. De-icing materials can be purchased at hardware stores. But don’t just focus on the area around your current home. If you can make it in advance, check out the conditions at your new home as well. Vacant houses can have lots of snow accumulation that hasn't yet been dealt with. And to keep yourself (and the movers) safe, invest in some slip-resistant equipment. “I recommend disposable shoe covers,” Peterson says. Even if conditions are good a couple of days before your move, don’t assume things will stay that way. “Keep de-icing material handy just in case anything changes,” Peterson adds. Driving a rented moving truck can be terrifying on a good day. You're navigating roads in a beast of a vehicle you've never driven before, with all of your precious belongings inside. Add in some bad weather, and you’re easily at panic level 9 just going down a residential street. But the key to your safety is easy: Just slow it down. Moving in bad weather isn't just stressful for you; it's kind of a nightmare for your movers, too. So before the movers arrive at your new home, make things easier for them (and you) by setting up a couple of safeguards to finish the move smoothly. If you're DIYing your move, set up an assembly line. Designate one person to stand inside and hand boxes to another person outside who can bring them to the truck. This way, you'll get unloaded faster, without damaging or dirtying up your floors. Finally, even though the movers might be used to braving bad weather, don’t force it if you're uncomfortable. Rescheduling movers can be difficult certain times of the year, but if you’re moving in the off-season, it may not be a big deal. “Generally, any time outside the busy May-to-September season rescheduling is much more feasible option as far as your movers having an open slot for you in the next couple of days,” Glanz says. But be sure to know your moving company's cancellation policy and call as far in advance as possible so you aren't slammed with an exorbitant cancellation fee.